Stop foreclosure sale date is something that should be handled by a foreclosure attorney when it involves filing a lawsuit or filing bankruptcy. The process of navigating to stop foreclosure sale date can be very stressful for a homeowner. When a homeowner receives a Notice of Default or a Notice of sale from a lender, time is of the essence to avoid an auction date scheduled in a few weeks. In most cases, the primary concern for the homeowner is how to stop foreclosure sale date. Most homeowners in California are faced with non-judicial foreclosure; which is the method most lenders prefer. Non-judicial foreclosure requires a trustee to adhere to certain procedures and requirements when conducting the non-judicial foreclosure. Because most foreclosures in California are non-judicial, borrowers receive a Notice of Default, providing the homeowner with 90 days to pay [“cure”] any amount due for missed payments and fees in order to reinstate the loan. Homeowners that do not meet the terms of the notice are sent a Notice of Trustee Sale, which will have a set date and time that the foreclosure will take place. The sale date is usually 20 days from the date of the Notice of Trustee Sale. To determine the best way to stop foreclosure, a proper analysis of the case needs to be done right away to establish whether the homeowner has a claim against the lender for wrongdoing. It is important to note that each case is unique; therefore, in the situation that a homeowner has a strong legal case with an active sale date, a lawsuit can be filed with a request for a temporary restraining order from the Court to stop foreclosure. To avoid foreclosure a homeowner can take legal action or take a risk and rely on the lender to stop the process by offering to modify the loan or entering into an agreement to short sell the property or deed it back to the lender [by way of a deed in lieu of foreclosure]. A homeowner can still stop a foreclosure by filing a lawsuit against the lender if the lender violates the rights of the homeowner. A lawsuit is a way of challenging the foreclosure process; to prevail in a lawsuit a foreclosure attorney must do their best to convince the court that the foreclosure should not take place. An experienced foreclosure lawyer will need to file the lawsuit on based on California foreclosure laws [SB900]. Under California foreclosure laws, lenders are held responsible for and mistakes and violations they make. A homeowner can also file for bankruptcy to stop the foreclosure, which automatically stops foreclosure in situations when a notice of foreclosure is served. Once a borrower files for bankruptcy, an automatic stay will go into effect that will act as an injunction, which will stop the foreclosure. Consumer Action Law Group is providing free foreclosure case evaluation for homeowners who want to stop foreclosure sales. The foreclosure attorneys at the firm can help homeowners determine if lender violated the SB900 and the best options for homeowner to stop foreclosure immediately. 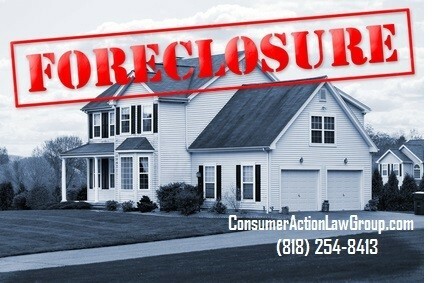 For more information about stopping foreclosure or hiring a foreclosure attorney visit https://consumeractionlawgroup.com or call 818-254-8413.